The excitement all starts back in November when I lamented my lack of sewing skills (but abundance of dress design ideas) on Twitter. Lady K Loves replied and said she'd be happy to see any designs that I had. So, I sent her some initial sketches and, after a long journey, this is where we've ended up - four designs that you, my dear readers, get to vote on. 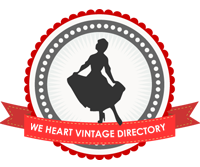 The winning design will be made into a very limited run from vintage fabrics and notions hand-picked by Lady K Loves (I'd love to be there to help pick them out but there's a whole lot of world between us that makes it a little tricky!) There will, of course, be one for yours truly to model and what-not so you'll get to see what I look like in one of my own designs. Design #1 - a strapless sun dress, in a light cotton, with pocket and button details in contrasting cotton-candy pink and bright red with a slightly flared skirt. Design #2 - based on the 'peasant' blouse design, this dress has a smocked waist, A-line skirt and princess sleeves. A cotton or rayon would be lovely for this dress, which I think would look great in a bold, graphic floral print. Opens/closes with a zip in the middle back. Design #3 - a wrap dress with button fastenings on the inside and outside (as in it wraps to a button closure on the inside as well as one on the outside) with a contrasting belt. Oh, and there's pockets! Design #4 - I think this full-skirted dress would look lovely in minty green with a little bit of brown. Button detail down front (fake) and closes with a side zip. I know these are all summer designs, which may seem odd from someone in the southern hemisphere at this time of year but I believe the bulk of my readers are entering into summer and Lady K Loves is a UK based company, so it makes sense to work with their seasons. Plus, I just happen to love summer dresses! So, which one is your favourite - all you have to do is vote on which design you'd like to see made! Note: some of the details of each dress may change during the design process, such as fabric type, etc. subject to what is available and what's practical. Also, please let me know if the poll works...I couldn't find a way to embed a poll in the post using blogger's poll feature so just googled for one. Those of you who read Retro Chick will have already seen Gemma's designs and, if you haven't go vote on her designs, too! Oh, and remember you can get 15% off at Lady K Loves when you enter the code 'andi_15' at the checkout. Pockets?!?! Number 3 for sure! It was very difficult to choose between four and two, but I eventually settled on two. They all look like such fun designs! I love the cut of #3! aloha lady! i have just discovered your blog, it sure is lovely, have just spent most of my evening doing a back trawl through it. fantastic to see some adelaide love too. nice to meet you! Ooh, I'm so torn between #2 and #3! I finally voted #2 though, because I've been looking for a dress like that. Ah how cute is this?! I am going to vote tight now. Hmm. It's tricky to pick a fav but here goes..! I like number 3! I would have said number 2, but I think the sunny weather means I'm feeling the nautical vibe at the moment! 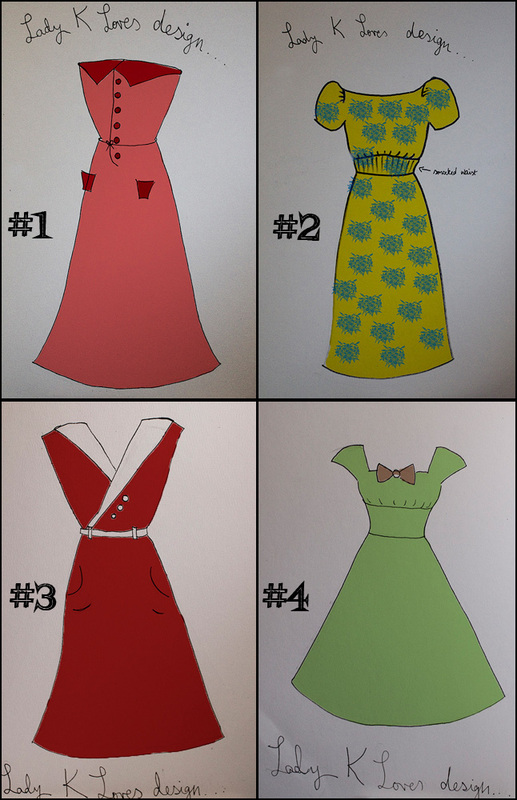 I picked #3, but looking over the comments I wish I'd picked #2 instead - there really isn't enough 40's print out there. All the designs are lovely - it was a difficult choice.